We had a wonderful CNY celebration the last 5 days and although it's back to school and work today for most people, the festive atmosphere still hangs in the air because there's intermittent bursts of fireworks and fire crackers and the lion dance troupes come around a dozen times a day. People still wear the lucky red color and wish each other "Gong xi fa cai, xin nien kuai le", which means "Happy prosperous new year". 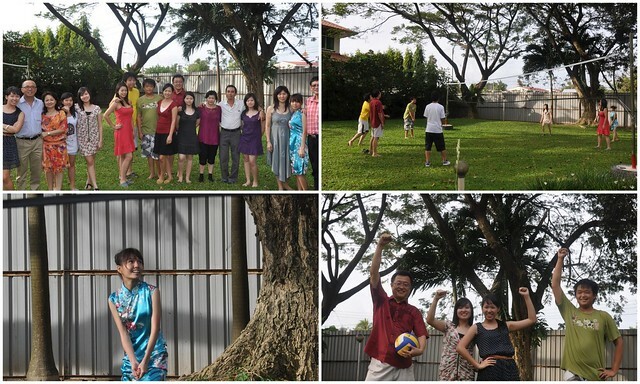 This is the time of the year for families to get together, to eat, to chat and to take family photos. 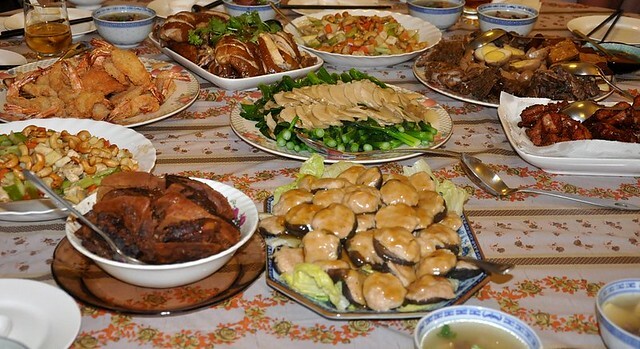 People come home from around the world for the most important dinner, the reunion dinner on the eve of CNY. Friends and relatives visit each other's houses and nibble on cookies and other home-made snacks. 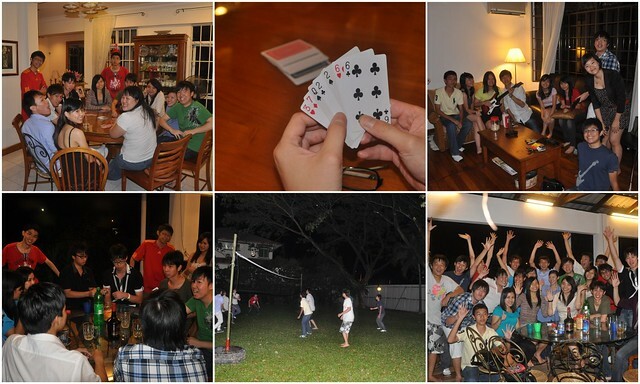 Dinners for the duration of the two-week celebration are the main events, usually followed by card games. 11 dishes at my MIL's reunion dinner, including a super delicious soup made from kampung chickens from my backyard, a fish that was still being steamed when this photo was taken and a tang sui (sweet soup) that only MIL can cook to perfection. Lou sang (raw fish salad) on the first day. 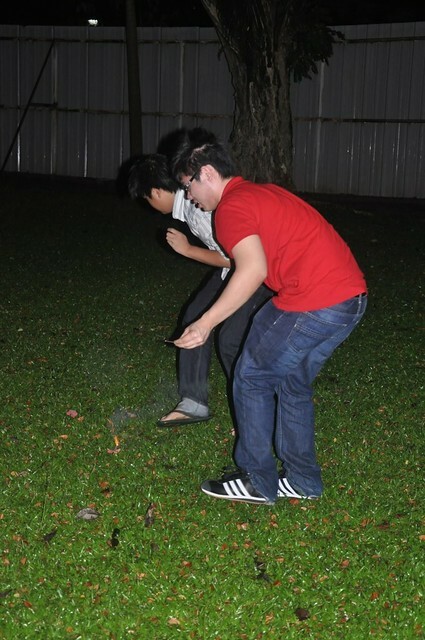 We had friends from Singapore and their kids have never played firecrackers before. Happy Chinese New Year Terri. It looks as though you and your family had a great time. Love the shots of your kids cooking. And wasn't it a good thing about the weather holding up on the first day. Gong xi fa cai to you too! great company and good food! Happy CNY! What a lovely spread at yr reunion dinner. Happy New Year to you and your family. 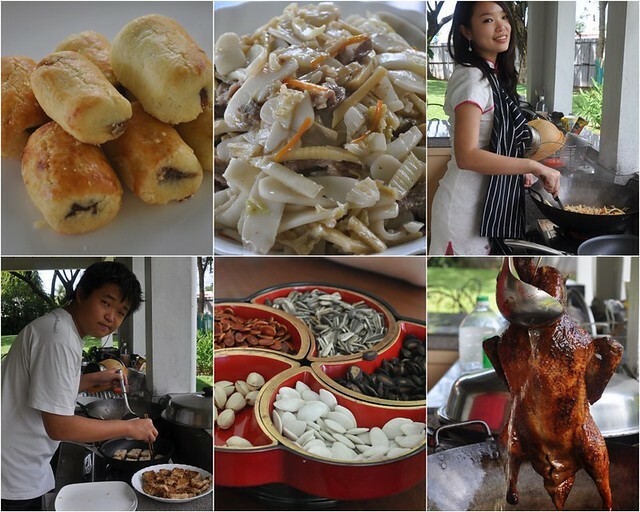 Wah, your reunion dinner food looks sumptious! Drool....Everyone looked like they had a great time! the food looks AMAZING!!!! would you Please please please share with us how to make the deep fried duck/chicken that Beautiful brown colour??? what is the marinade process? m & m m: i just love the weather we've been having the last 2 to 3 months. if only it's like this all year. malaymui: gong xi fa cai! what a life you are having now. it's my dream! baby sumo: happy cny to you too! co: happy cny to you too! 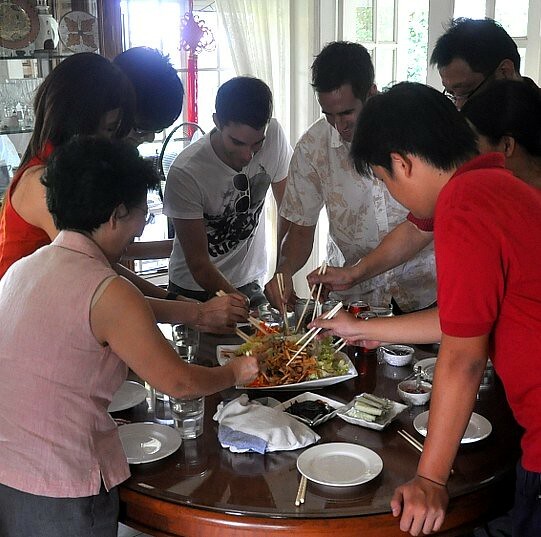 tina: yes we had a great time but in two weeks my son'll be going back to oz..:(( happy cny to you n pat! alison: lol, the duck was bought ready cooked. i just warmed it up in hot oil :D, served it with pancakes n cuke strips n hoisin-plum sauce. Still not too late to wish you Gong Xi Fa Cai, Terri! I do miss the big family gatherings during festive seasons. Nothing like catching up with everyone over cookies, mandarins and black jack!! I see that you cooked rice cakes (we call them Shanghai Nin Gao). Could you please share your recipe? I understand there is a technique to cooking it so that it's not too hard and not too soft. Thanks!